Description: This is Kathy’s most popular workshop. 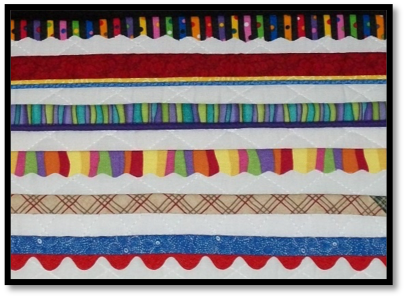 Students will learn a variety of techniques to complete the edges of their quilts while making take-home samples. There is a kit for this class and each student will need a sewing machine. 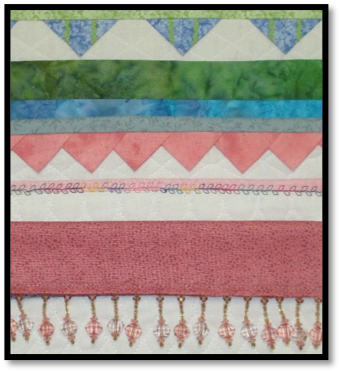 Note: This is a follow-up workshop to Kathy’s workshop called Quilts with Great Edges. These classes are often taught as a two-day class. If not, students should take these classes in order because no information is repeated from the first workshop in this second workshop. Description: Students will learn more techniques to complete the edges of their quilts while making take-home samples. There is a kit for this class and each student will need a sewing machine. Description: Working with wool is currently popular among quilt makers. This 20” x 44” project will make a wonderful addition to any home. Kathy has a unique technique for making the green scalloped border. Making the basket with six different flowers, leaves & birds will keep everyone busy throughout the day. The applique edges can be finished by hand or machine after class. All of the wool for this project are included in a kit with detailed instructions. Description: This is one of Kathy’s newest classes. Students will spend the morning making a wool scene for the top of the box. 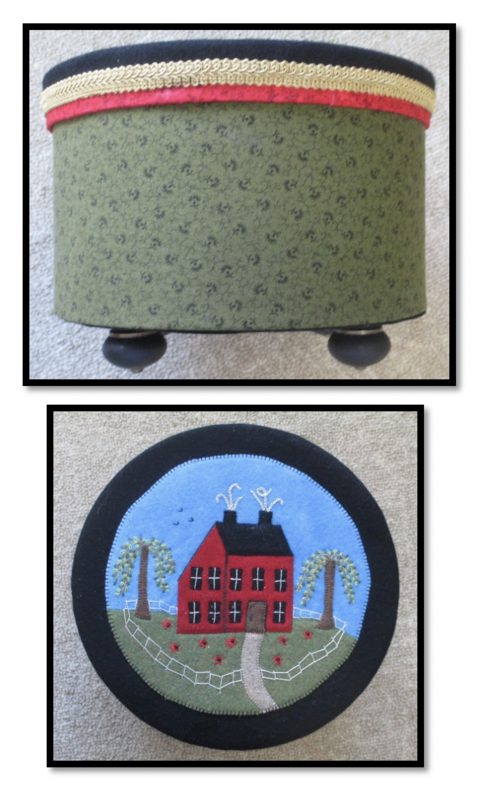 In the afternoon, they will learn to cover a round box with fabric and trim, inside and out. Kathy brings a variety of boxes she has made for the students to see. All of the necessary items to make the box are in the kit. No sewing machines are needed in class. 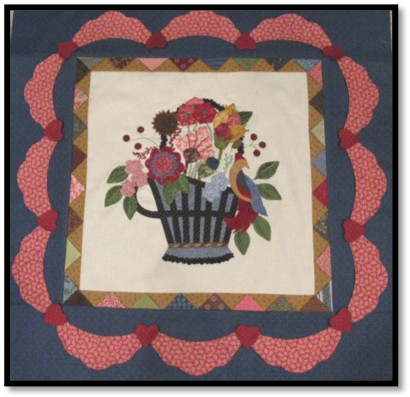 Description: The Coxcomb Crossing is an applique pattern often found in antique quilts. It is an easy pattern for beginners to learn hand applique techniques. Those experienced in applique will be able to learn great tips to sharpen their applique skills. The center is a ruched flower which is also a 19thc. technique that Kathy will teach in the class. Students will bring their own fabrics so they can choose their favorite colors for the project. This 15” x 15” block can be finished as a pillow or wall hanging or be the start of a new quilt. 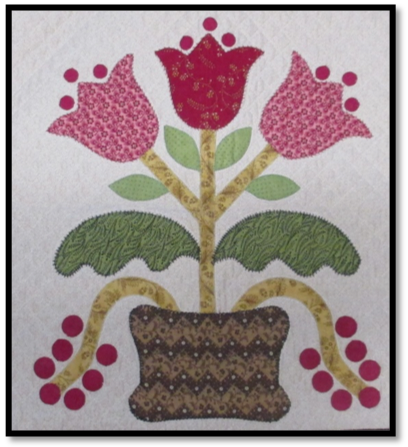 Description: Kathy developed this folk-art pattern for her book called Ozark Varieties. The workshop is filled with tips for making perfect applique designs. Learn how to finish the edges of the shapes by machine. Students will bring their own fabrics so they can choose their favorite colors for the project. This 15” x 15” block can become a pillow or wall hanging or be the start of a new quilt. Each student will need a sewing machine in the afternoon to learn the machine applique stitches. Description: Learn a variety of applique techniques while making this dimensional basket. 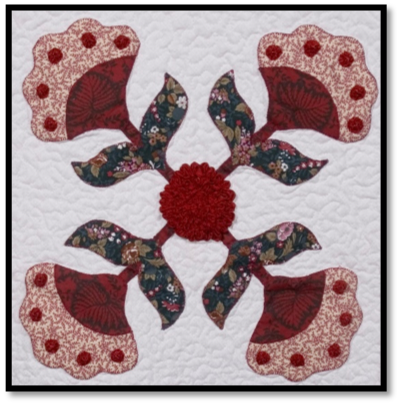 The central design can be finished with plain borders or an inner border with inserted prairie points and an outer border with appliqued scallops (included with the pattern.) The size of this wall hanging with borders is 30” x 30”. This is a great workshop to help take your applique skills to a new level. Description: Broderie Perse, also known as Persian Embroidery, is a 17thc. European style of applique which used printed elements of fabric to make a new design. Because fabric was so expensive in early America, the colonists used this technique to add colors and motifs to a less expensive muslin background. Students will bring their own fabrics and create their own design. 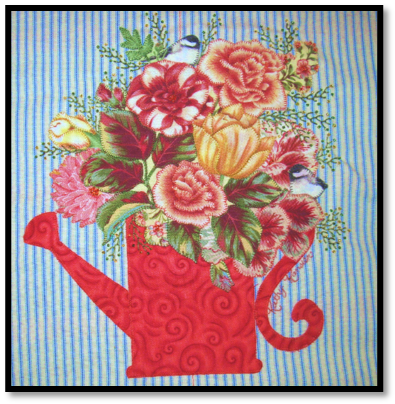 Kathy’s directions include patterns for a watering can, vase, basket or urn in which flowers, leaves & birds can be placed. Hand embroidery, beads and inking can be added for details. The fused edges of the elements will be finished by machine after class so students will not need to bring their sewing machine. 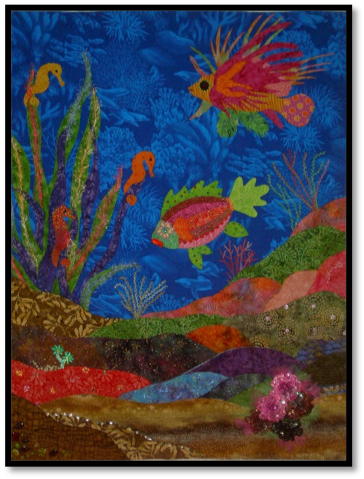 Description: This is a great class to learn all about colors and design while creating an underwater scene. There is not a pattern for this class but Kathy will help each student develop their unique design. The designs will include rocks, fish and plants. Hand embroidery, beading, sheer overlays and dimensional techniques will be taught. The applique edges will be finished at home by machine so students do not need a sewing machine for this class. Because there are so many shapes, this is a good project to later practice machine quilting designs on a home machine. Bring plenty of fabrics, especially batiks for this fun day. Description: This is Kathy’s newest workshop and one many of her students have been asking for. Students will learn a variety of single and combined embroidery stitches to enhance their quilting projects. The kit for this sampler includes detailed instructions, Valdani threads, pre-cut wool shapes for the center floral design and a beautiful linen fabric for the background from Valdani Threads. Their finished 11” x 15” sampler of stitches can be framed for display. Gather the pieces that are left over. Let nothing be wasted.